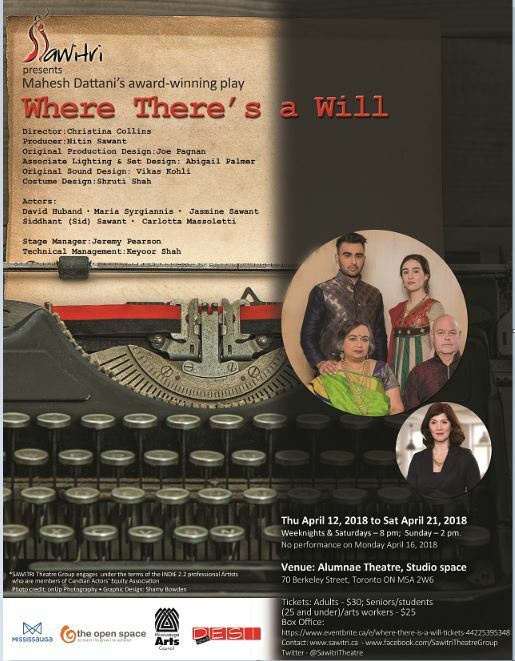 Sawitri Theatre‘s Where There’s A Will, currently playing at the Alumnae Theatre, is a wildly clever two-act comedy penned by renowned Indian playwright Mahesh Dattani. The play shines a light on the lives of a dysfunctional middle-class Indian family as they verbally duke out their deep-seated inter-familial qualms. 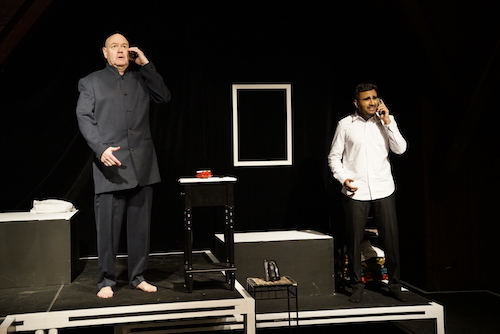 David Huband leads the pack as Hasmukh Mehta, the grumpy, harsh-tongued dad. He’s the head of the family and lets everyone know it. He resents his free-loading millennial son, Ajit (Siddhant Sawant), he loathes his wife, Sonal (Jasmine Sawant), and is highly suspicious of his daughter-in-law, Preeti (Carlotta Massoletti) who is, in his eyes, “as sly as a snake.” When Hasmukh unexpectedly passes away, the household is turned upside down as the family scrambles to fulfill the terms of his strangely demanding will. It’s very clear that playwright Mahesh Dattani has a knack for that good ol’ relatable situational comedy. There were several moments during the show where I sincerely giggled my head off. One that was particularly funny to me was when a fight broke out over the issue of whether or not Sonal should make more parathas. It was the kind of quick-fire argument you’d find on any given episode of Seinfeld, and this specific bit is totally sitcom worthy. These funny moments of wordplay are peppered throughout Dattani’s fine script and give the show a boost. The material is strong in this way, but the overall production didn’t totally make the mark for me. Though individually very talented in their own right, the cast lacked chemistry as a group. I didn’t quite believe that they could be a family in real life, let alone in the universe of the play. On top of this palpable disconnect, there were several moments where lines were flubbed, and this continuously would take me out of the moment. I’m not sure if it was due to lack of rehearsal or lack of direction, but unfortunately I found that Sawitri’s interpretation didn’t do the script justice. The characters for me were very one-note, and thus together didn’t reach full-on wacky sitcom family status, which I could see the script was just begging for. There was, however, a bright spot in this sometimes uneven performance. All of those funny bits I was talking about earlier were executed with dead pan wit by Jasmine Sawant (Sonal). Her seamlessly delivered punch lines were refreshing amongst the stumbles. Where There’s A Will wasn’t everything I had hoped it would be, but despite the occasional bout of clumsiness and confusion on stage, I could still appreciate the humour in Dattani’s highly unique and entertaining story. Where There’s A Will is playing at the Alumnae Theatre (70 Berekely St.) until April 21, 2018. Shows run Tuesday to Saturday at 8pm, with one matinee at 2pm on Saturday, April 15th. Tickets are $30 ($25 for arts workers, seniors and students) and can be purchased in person at the Alumnae Theatre box office before the show.